The 2014 Earth Structure & Dynamics class field trip left Williamsburg at 1 p.m. last Friday bound for the Blue Ridge Mountains and points beyond. We would not return to campus until 3 p.m. on Sunday afternoon, some 50 hours after our departure. The field trip is a spring tradition that’s been enjoyed by students for years. On this year’s excursion we reveled in bountiful sunshine and mild temperatures. We also saw an array of rocks and structures that tell the story of Virginia’s geologic history. Generalized geologic map of part of central and northwestern Virginia illustrating rock units and our outbound field trip route. On this trip, students do geology in the field and in the process become familiar with the tectonic history of the Appalachian Mountains. Students work in teams of two and answer an array of questions at each outcrop (here are a few team names from this year’s trip: the Away Team, the Zesty Xenoliths, the Russian Judges, Team Stylo- Lightening, and the aptly named Despicable Fluffy Marmosets). Hour 3- examining a lineated granodioritic gneiss in an old quarry at Columbia, Virginia. Starting from the Coastal Plain we journeyed across the Piedmont on Friday afternoon. We swarmed outcrops in parks and along country roads. At an old quarry in the little town of Columbia we examined a lineated granodioritic gneiss that crystallized back in the Ordovician (~460 million years ago), and was later stretched during the continental collision that created Pangaea. Our campsite was at the foot of the Blue Ridge Mountains and we headed straight into the range on Saturday morning to examine basement rocks, ancient lava flows, and tilted strata. We lunched on outcrops of sheared limestone and dolostone exposed in the Shenandoah Valley. Hour 29- the 2014 Earth Structure & Dynamics class strikes a pose atop Massanutten Mountain (note the Shenandoah Valley in the mid-ground and the Blue Ridge Mountains in the background). The afternoon hours included a mapping exercise on the flank of Massanutten Mountain. On Massanutten’s crest, among the ever-lengthening late afternoon shadows, we marveled that the old Blue Ridge basement rocks, upon which we had stood that morning, were buried some 6 to 8 kilometers below our feet here in the Valley & Ridge province. Geologic cross section from the Valley & Ridge to Blue Ridge in north-central Virginia. Note the basement rocks that are exposed in the Blue Ridge are buried deep in the subsurface in the Valley & Ridge. Modified from Bailey et al. (2006). 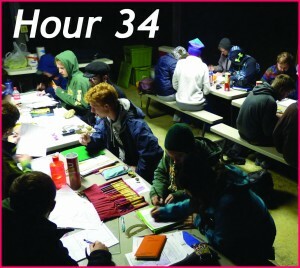 Hour 34- Saturday night fun with geologic maps and cross sections on the Earth Structure & Dynamics field trip. Evening hours back in camp were fun and involved completing the geologic map and cross section from our afternoon foray in the Valley & Ridge province. What could be better on a Saturday night? We also discussed the key role that time and place play in geology. On Friday afternoon in Columbia we’d observed plutonic rocks that formed in an Ordovician volcanic arc; on Saturday afternoon in the Shenandoah Valley we examined fossiliferous strata that were deposited at the margin of an Ordovician sea whose shores lapped onto eastern North America. 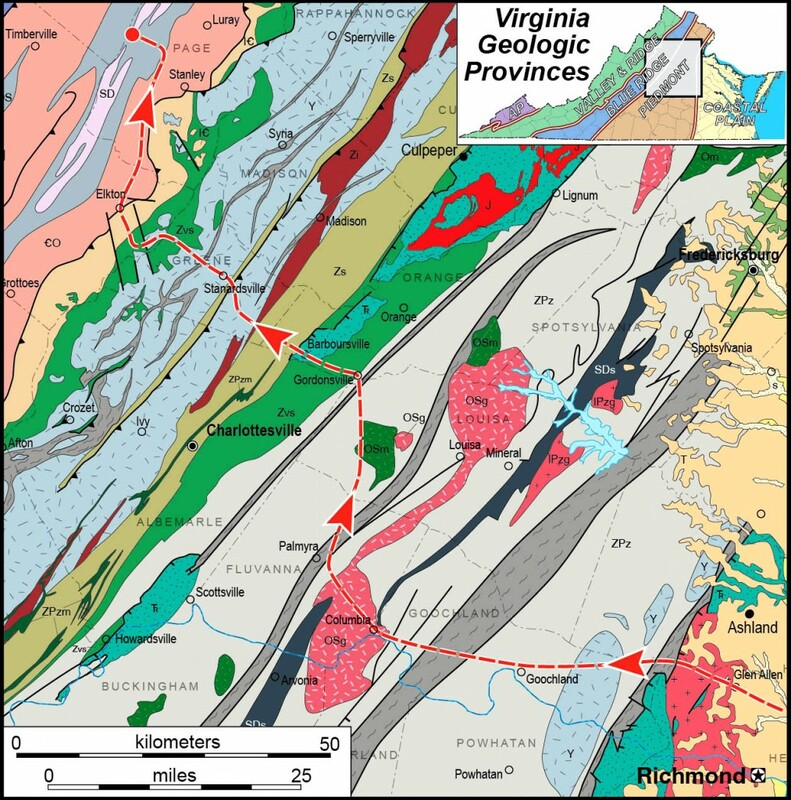 In the modern world the Shenandoah Valley and Columbia, Virginia are ~80 kilometers (~50 miles) apart, in the Ordovician world they were separated by 300 to 500 kilometers (~200 to 300 miles) and in very different geologic settings. In the late Paleozoic these rocks were deformed, metamorphosed, and transported considerable distance to the northwest forming the geologic structures that we puzzle over today. Experience in the field is an important component in the William & Mary Geology curriculum, as going to the field and working through geologic questions on the outcrop can’t be replicated in the classroom. 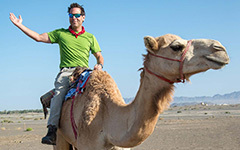 Fieldwork is not always easy, but 50 hours in the field provides an opportunity for the latest crew of W&M geologists to practice their craft and revel in the wonderful world away from campus. Fun and informative trip! Thanks for taking us, Chuck!! Those were some rachet outcrops! Looking forward to more delicious trips to the Blue Ridge! Fantastic trip! Enjoyed being in the field.